This page is my running diary for 2005. Go to the end of the page to see how the year finished. I thought my 2004 diary would be enough to cure most people's insomnia but Plu started a club for bloggers, so I decided to continue recording how I run. Running goals for 2005 - On the track: 1500m in 5:08, 3000m in 10:58, 5000m in 19:08, 10,000m in 40:58 and High Jump in 1.50m. Other events: 10k road in 39:58, Half Marathon in 91:00, Six Foot Track in 5:59:59. Run 4000 kilometres. If you want to leave a comment you can visit my blog of words. 3 Jan 10.2 Speedygeese Nth Lyneham. 3.1k warm-up 17:12. Plan was for 12x45 seconds hard but right calf felt sore after a couple so 23mins steady. 3.1k warm-down in 17:45. 4 Jan 12 Race: ACT 10,000m Champs, 16th (last) 44:53.45. Splits, 4:14 4:14 4:23 4:29 4:35 (21:55) 4:36 4:37 4:40 4:41 4:24 (22:58). Calf sore throughout, breathing OK.
5 Jan 13 Weston Park via Stirling Hills bush with Chris, Elizabeth and Dennis in 74:35 (5:44/km) 50% on dirt. I think calf helped by this shuffling run. Not as sore to touch after. 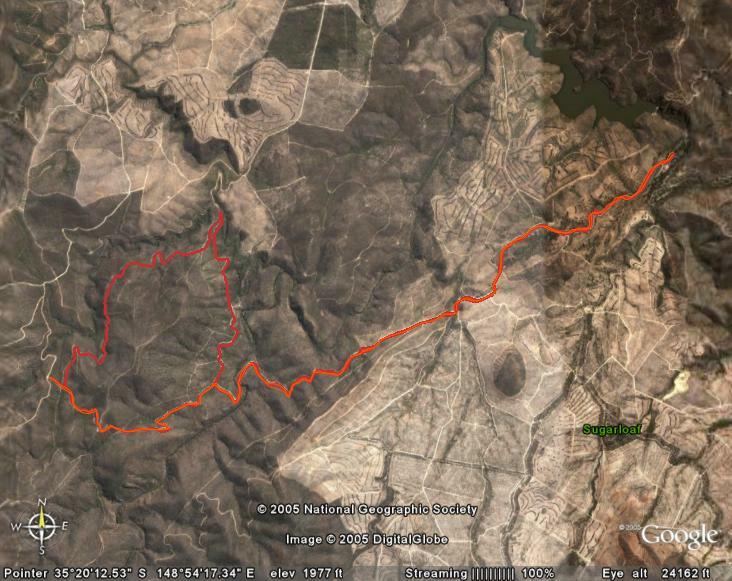 6 Jan 9.8 Long lap of Mt Tuggeranong track in 53:48 (5:28/km), a slightly faster shuffle than yesterday. Ran gingerly on hills as still worried by slight pain low in right calf. 7 Jan 3 Easy run to Freda Gibson Ct in 16:26 (5:29/km). Late decision to run. Was going to have a day off but didn't want to see 'nil' so early in 2005. Obsessive or what? 8 Jan 21.2 Molonglo Reach, Ainslie, Majura with Steve Appleby group in 2:01:16 (5:43/km). Cool about 12c! Calf 95%. Felt good, extra 1.5k on bike path. Many others running. 9 Jan 13.1 8pm Gilmore track up to railway. Easy recovery run in 71:51 (5:32/km). Very ugly awkward and weak first half followed by a Jennifer Hawkins-like second half. Week 01 82k - A good week to start 2005. The track 10k was OK as was the long run. 10 Jan 9.3 Speedygeese Nth Lyneham. 3.1k warm-up 17:29. 3x1k 'steady' in 4:23, 4:27, 4:54 with 4:30 rests. 3.1k warm-down 17:20. Very tired. Still slight soreness in right calf. 11 Jan 3 After Interclub ran very easy warm-down laps on grass around outside of track with Geoff in 18:59. Right calf is still feeling slightly tender. Kelly ran a 5:01 mile. 12 Jan 18.2 Stood up so ran alone. PH to Stirling Hills bush then Waste Basin bike path thinking all the time 'how hot is this?'! 97:55 (5:23/km). Saw VP sans helmet - bad boy. 13 Jan 4 Calwell track. Hot! Short session with Karen. 5x200m concentrating on form. 46 45 44 43 43. Full recovery. Tired, no energy. Could have easily slept under the trees. 14 Jan 6.3 10pm and still 28 degrees! Suburban hilly, easy - Casey, Downard, Tatchell St out/back in 34:51 (5:32/km). Starry night, southern Canberra lights, grasshoppers. 15 Jan 23.2 Steve Appleby group 7:10am Mt Ainslie to Mt Majura loop including zig-zag single track. 2:20:15 (6:02/km). Cooler, drank heaps. Felt better than last week! 16 Jan nil Slept in. Fixing computer so no time to run. Saw 'Meet the Fockers' with Mal and Joy. Very funny. Maybe I'm too Robert De Niro-like and need 'Fockerising'? Week 02 64k - Good again especially the long runs. Total down a tad. Calf better. 17 Jan 9.2 Speedygeese Nth Lyneham. 3.1k warm-up 17:16. 2x'1400m' hill loop in 5:55 and 5:50 with 8 minutes recovery. Tired but strong. No injuries. 3.1k warm-down 17:52. 18 Jan 6.3 9pm, same run as last Friday in 32:40 (5:11/km) easy on hills. Bright half moon in north-west. Cool breeze. Ran on road - softer than footpath. Felt good. 19 Jan 19.6 PH to Yacht Club long then West Basin bike path in 1:40:29 (5:08/km). A pleasant 26 degrees. 5min km to 14 then it turned less than pretty. Need new shoes. 20 Jan nil There's a dark cloud rising from behind the mountains, I packed my shoes and headed straight away from the storm, Gonna be a hail-storm to blow everything down, That ain't got the faith to stand its ground. 22 Jan 25.6 With Steve Appleby, Ainslie to Majura via Triple-Tri track and down zig-zag. Back via War Memorial in 2:41:10 (6:18/km). Warm, felt as good as last week! 23 Jan 8 7.30pm easy out/back via floodway dirt track to Richardson shops in 41:32 (5:12/km). Quite quick!? Sydney-like humidity. Mmmm - new Brooks Radius shoes. Week 03 69k - Very pleased with the long runs. Plan big mileage next week. 24 Jan 11.5 Speedygeese Nth Lyneham. 3.1k warm-up 16:59. 1x'1400m' hill loop strong in 5:31. Long 7k warm-down. Felt good but tired. A Caramelo Koala deserving effort. 25 Jan 4.5 After Interclub ran a couple of laps on the grass around the track then out to Calvary Hospital. 26:57. Left knee a little sore. Warm. Full moon rising. 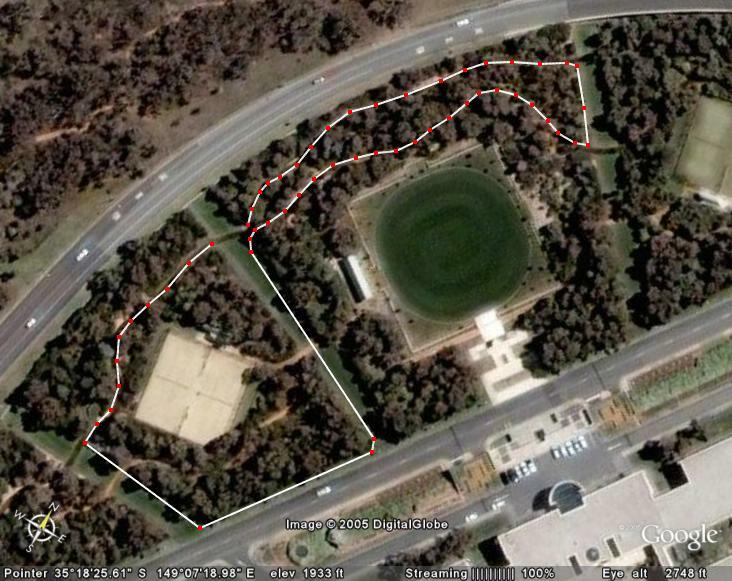 26 Jan 26.3 7am: Lap of East Basin then Mt Ainslie to War Memorial 20.3k in 1:54:42 (5:39/km). 6.40pm: Recovery via drain to Calwell shops 6k in 34:41. Knee good, hammys tight. 27 Jan 9.9 From Calwell track, long warm-up with older runners around Theodore trail 7.4k in 36:33 (4:56/km). Too tired to do speedwork. 2.5k warm-down in 13:22. 28 Jan 12 6:40pm Gilmore track up to railway. Warm. Ran easily in 65:31 (5:27/km). Stopped at 12 and walked the last km home to save a bit for tomorrow's long run. 29 Jan 28.6 With Steve Appleby, to summit of Majura via 2-Peaks course in reverse, back via Triple Tri, War Memorial in 2:58:53 (6:15/km). 20 degrees. Felt good. 30 Jan 12.1 Masters' H'cap Campbell Park. Easy bush 6.01km in 29:44 (4:56/km) trying to run cruisey, not race. 2k warm-up, 4.1k warm-down. Hot and humid. No problems. Week 04 105k - Biggest week for a few years. Good long runs. 320km last 4 weeks. 31 Jan 12.3 Speedygeese Nth Lyneham. 3.1k warm-up 17:52. Ran another 3 laps, one with Trevor quickish - total time 68:48 (5:36/km). Hot. Tired but legs felt good! 1 Feb 8 8.30pm after Interclub, out/back on a very wet bikepath to O'Connor in 41:06 (5:08/km). Just allowing legs to roll along. Not pushing hard at all. Humid. 2 Feb 10 Cold, damp and windy! Out/back Gilmore track up to railway in 54:23 (5:26/km). 8pm club meeting so not enough time to run longer. Will try tomorrow. 3 Feb 9.4 From Calwell track. Bloody freezing, windy! 2.5k warm-up in 12:40. Ran through Melrose Pines single tracks 5.9k at 5:33/km. 5x200m easy with Karen. 4 Feb nil I thought a rest day wouldn't do any harm as I want to run lots of kilometres this weekend. Met Jim Guy Tucker at Woden for coffee after work. 5 Feb 30 9.30am solo out/back to O'Malley via Mt Wanniassa, Isaacs 2:55:50 (5:52/km). Good first 26k, Lyle Lovett-like last 4k. Cool, didn't drink enough. 6 Feb 12.8 7am: With Gordon, Lanyon valley fire trail 12.8k in 1:17:12 (6:01/km). Felt good. Was going to do an easy run in the afternoon but had a nap instead. Week 05 82k - Good training week, bad weather! Missed my mid-week long run. 7 Feb 15.5 Speedygeese Nth Lyneham. Easy 5 laps of 3.1k - 18.40, 18.52 17.33, 18.51, 18.55 - (5:59/km ave). Legs felt good, no injury problems. Lovely and warm. 8 Feb 9.7 From Calwell track. Hot. Steady 7k Theodore track in 37:56 (5:24/km) pushing a little on hills. 7x200m easy with Karen, 100 jog. Some barefoot. 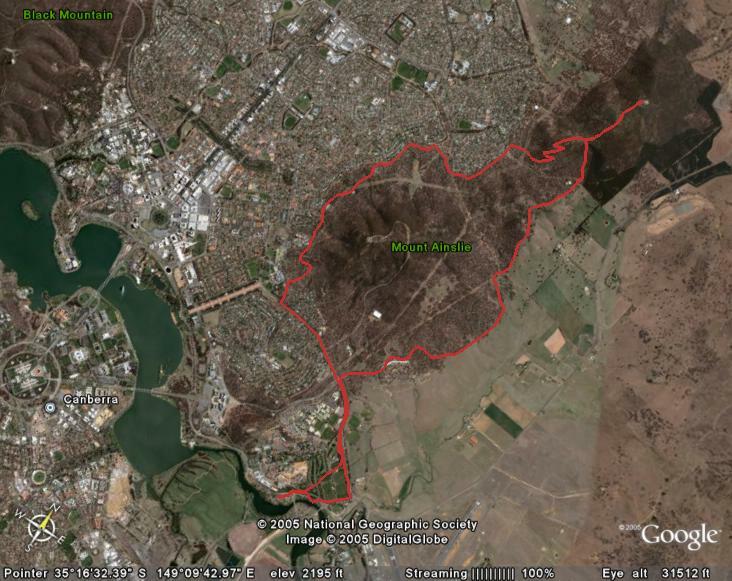 9 Feb 24.3 PH to Yacht Club, East Basin Wetlands, with Chris, Dennis then Stirling Hills bush in 2:15:42 (5:34/km). Felt good but tired. Cooler 22C, windy. 10 Feb 6.3 Calwell 2.5k warm-up 14:09 easy. 8x200m, 100m jog rec 40sec - 46 46 47 45 45 45 45 43. Masters' 1500m walk 8:02. High Jump 1.30m no spikes. 11 Feb 6.3 7pm easy out/back dirt track by floodway to Calwell shops in 33:32 (5:18/km). Just letting it flow. Easy breathing. Hope the long run goes well. 12 Feb 34.5 7am. Summit Mt Majura 2 Peaks reverse, back short with Chris, Mark then lap of East Basin in 3:38:24 (6:20/km). Felt good. Cliffy shuffle last 3k. 13 Feb 11 5.30pm easy out/back Gilmore track to railway in 61:56 (5:38/km). Cooler. Legs knew they'd done something yesterday. OK middle kms. A bit tired. Week 06 107k - Again a good week. Coping better with the long runs. No injuries. 14 Feb 12.3 Speedygeese Nth Lyneham. 3.1k warm-up 18:19. 3k 'time trial' 2nd half hardish in 13:45. OK. 2 laps warm-down 18:45, 18:31. Tired - big day at work. Hot. 15 Feb nil Donated blood so didn't run. Haemoglobin was low at 132g/L which might explain some tiredness. Need to find some fresh runners (I mean meat). 16 Feb 23 PH, Yacht Club, Stirling Hills bush, Weston Park with Chris, Graeme, Elizabeth then solo to Boathouse in 2:16:17 (5:55/km). Tired but felt good. 17 Feb 9.6 Calwell track. Theodore trail loop 7.8k in 40:32 (5:12/km) rolling hills, hard run. Easy 6x100m barefoot afterwards with Karen and 1.2k warm down. 18 Feb 6.0 7.30pm dirt track by floodway to Calwell in 32:40 (5:26/km). Very tired beforehand. Could easily have done nothing. Humid. Early night needed. 19 Feb 35.2 7am. Summit Mt Ainslie, Trent's grave hill, Mtn Champs course to zig-zag, umpteen more hills, East and Central Basin LBG in 3:58:13 (6:46/km). OK.
20 Feb 4 Only had time for a short run as I was meeting Joy and Mal to see 'The Aviator'. Out/back Nth Theodore in 22:45 (5:41/km). Legs fine but zero energy! Week 07 90k - Training going well (touch wood). A bit worried about the 10k race! 21 Feb 13.7 Speedygeese Nth Lyneham. Gawky first km of 3.1k in 17:04. 'Start practise' then a downpour. 2 laps in rivers of mud, 1 dry in 17:07, 17:25, 17:10. (5:34/km). 22 Feb 11.8 Ran to Calwell track. 5k solid run (5:20's) up to railway with Kathy and kids. 8x200m barefoot with Karen 44.3 ave. Legs OK, zero energy. Walked the 2k home. 23 Feb 12 PH to Yacht Club then Central Basin with Graeme and Chris. 12k in 69:26 (5:47/km). Hot - 30 degrees. Still no energy. Felt like walking - don't know why. 24 Feb 3.5 Masters' 10,000m track Champs. Warm. Had an overwhelming feeling of tiredness. Lost the group early and stopped at 2k (8:21). Hope it's nothing serious. 25 Feb nil Decided not to run in the hope that a rest day might cure the lethargy I've been feeling this week. A couple of mountains planned by Steve tomorrow! 26 Feb 30 7am. Molonglo to rollercoaster, zig-zag, summit Majura, 2 Peaks course, summit Ainslie, Campbell Park in 3:08:04 (6:16/km). Warm, humid but felt good! 27 Feb 6.5 8.30am. Masters' H'cap Nth Curtain 6.5k in 31:12 (4:48/km) easy uphill, striding out down. Was going to do an easy run in the afternoon but CR happens. Week 08 77k - Sad about the 10000 but happy with Saturday. 356km last 4 weeks. 28 Feb 7.5 Speedygeese Nth Lyneham. 3.1k warm-up 17:50. 4x1 minute 'hard' walk back recovery. Kept up with Tony, Maria but behind Jenny. 3.1k warm-down 18:03. 1 Mar 10.1 Track, Calwell. 5.2k warm-up easy dirt 30:39. 2 sets 3x400m 1:1 with Karen, Christie 95 88 91 - 90 89 89. Steady, barefoot, felt OK. Hot! 2.5k w-down 14:54. 2 Mar 9.5 PH Yacht Club Central Basin reverse with Chris 50:28 (5:19/km). Forgot Forerunner so approx. Ran fairly hard. Sore legs, left knee, from speedwork? Cool wind. 3 Mar 5 Track, Calwell. 2.5k warm-up in 13:10. Ran 5x200m with Karen, walk back - 48 44 46 43 43 - quads still sore. 1.5k warm-down. A bit slack, didn't feel guilty. 4 Mar nil No run, but walked many laps of the Mall - don't you hate that! Some leg soreness this week from jumping into barefoot speedwork, my first for ages. 5 Mar 16.3 7am Molonglo, Campbell Park, around base of Mt Ainslie 96:40 (5:55/km) with Steve and Carol. Very easy. Cool 20C. Felt good. Soreness gone from legs. 6 Mar 7 6pm. Another brilliant autumn day! Out/back to Calwell by floodway on dirt plus extra in 35:11 (5:02/km). Felt good. Not pushing, just letting it flow. Week 09 55k - A very enjoyable week. Great not to be feeling tired all the time! 7 Mar 9.2 Speedygeese Nth Lyneham. 3.1k warm-up 17:51. 3k 'time trial' 13:15 (4:19, 4:38, 4:18). GPS said 3.00km! 3.1k warm-down 17:19. Tired in warm-up. OK in 3k. 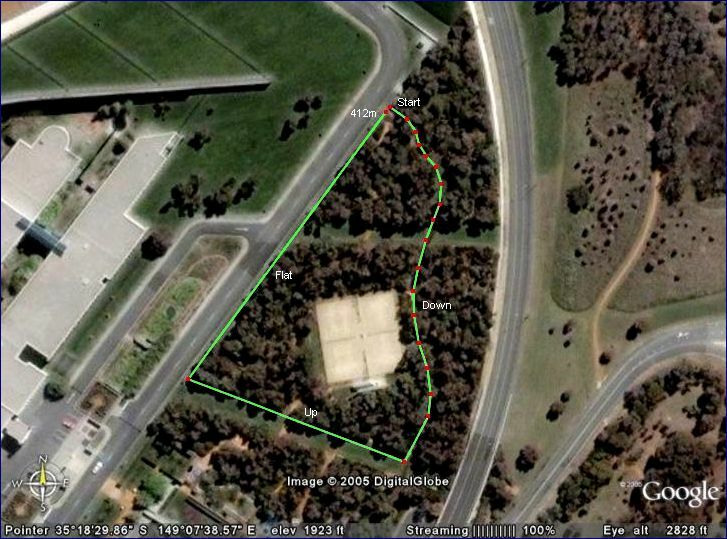 8 Mar 7.5 Ran from home to Calwell track 3k in 16:03. Easy 5x300m full recovery 76 68 65 64 61. Felt clunky wearing shoes! Warm-down home 3k in 17:28. No energy. 9 Mar nil I decided a day off wouldn't do any harm. I've been busy/tired at work this week. I don't want to go for an easy run and feel flat again - bad for the mind. 10 Mar 4.9 Track, Calwell. 1.5k warm-up. 1x150, 4x200m easy with Karen. 37 44 43 44 41. 2.5k warm-down 16:12. Felt OK. Two 200's barefoot. A tiring work day. 11 Mar nil Drove to Sydney (Bella Vista) arriving 5pm. Then to our digs at Katoomba. Meal at Indian on Narrow Neck then numbers at The Edge from Plu at 9pm! 12 Mar 45 Race: Six Foot Track. 417th in 6:18:09. Cox's in 2:10, Pluvi in 4:06. Felt good. No real problems. Hot but drank heaps. Jennifer had to retire. More here! 13 Mar nil Legs fine except for slight quad soreness from running the last downhill hard. Took my Nike Frees for a walk down Cliff Road to an old lookout. A beautiful day. Week 10 66k - Happy with a Six Foot PB. In 2006 I'll run more to the Cox's River. 14 Mar nil Working late so no time to run. Quads still a little sore to touch. No blisters - pleased I put vaseline on my heels at the Alum Creek aid station. 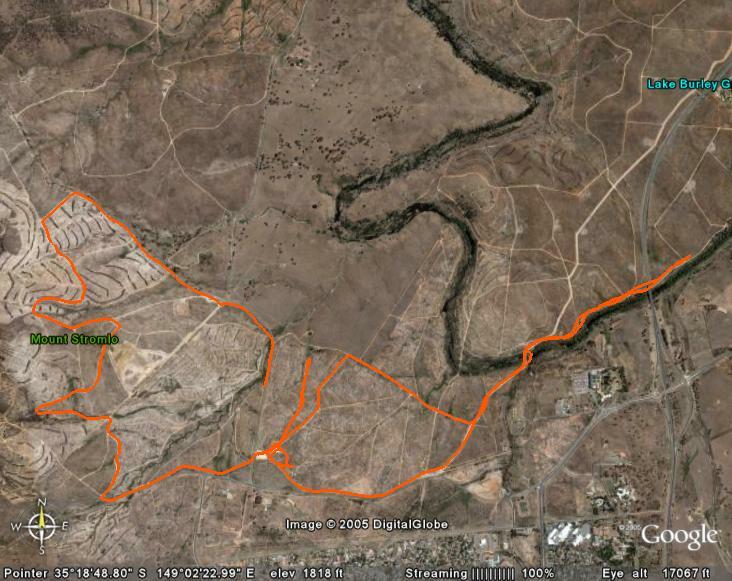 15 Mar 7 Ran the CCC Summer Series 5km at Black Mtn Peninsula steadily in 24:17. Started easy, picking it up. Laps: 8:32 8:12 7:33. Legs felt OK. Hot again! 16 Mar nil Another late day at work :( Would have liked to run but another day off won't do any harm. No time to even get on the computer. Bugger! 17 Mar 8 Race: Masters' 5000m Track Champs. 16th in 21:03. Splits: 3:59, 4:03, 4:23, 4:27, 4:11. Nike Frees - fantastic! Felt a bit tired. Sprint last 200m to beat Jim. 18 Mar nil My third day off this week but I think it's needed. Worked late. I've been feeling pretty tired and haven't been getting enough hours sleep each night. 19 Mar 30 From Molonglo 7am. Blessedly cool. Ran mainly with Carol Baird and Chris over Trent's hill 15.3k. Then alone around Central, East Basin LBG in 2:49:28. (5:39/km). 20 Mar 8 Masters' Handicap at Kowen Forest. 7.5k undulating in 40:13 (5:22). Ran easily enjoying the smooth gravel roads, smell of the Radiata Pines and perfect weather. Week 11 53k - Strange week. Supposedly 'recovery' but a good 30k on Saturday. 21 Mar nil Started raining just as I was about to head out the door. Didn't need convincing to stay inside as I had work to do on SCT's Fadden Pines CC program. 22 Mar 7 Race: CCC Summer Series 5k Yacht Club out/back flat bike path. Ran hard for 21:55! Not good. Weak second half. Split 10:37/11:17. Only 400m warm-up. 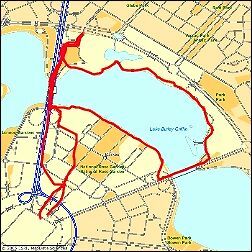 23 Mar 13.3 From PH to Yacht Club, back to PH trails then Rec Place and around lake in 1:10:58 (5:20/km). Ran easily with Chris. Cool. Legs felt good. Could have run more. 24 Mar 9 Track, Calwell. Ran to track in 15:57. 5x800m 3 minute walk recovery, 3:29 3:23 3:25 3:20 3:15. Good start. Nike Frees were brilliant! 2.5k warm-down 16:08. 25 Mar nil Perhaps should have run short/easy. Justify a rest as yesterday was hard and I plan to run 30k or more tomorrow morning. I've decided to run Canberra. 26 Mar 34 Molonglo 7am. To Majura water tank, back via War Memorial 19.8k. Then solo wetlands, Central Basin in 3:17:05 (5:47/km). Felt good! Perfect weather. 27 Mar nil Felt like going for an easy run but time got away - don't you hate that! A pity as it was a beautiful day. No soreness at all from yesterday's run. Week 12 63k - Really pleased with the long run on Saturday! 237km last 4 weeks. 28 Mar 9 Up to Railway and back mostly on dirt in 47:22 (5:16/km). Let it flow on flats and downs, easy on ups. A scheduled recovery day, surprised how quick it was. 29 Mar 9 Ran to the track after a tiring day at work. Did a long 'warm-up' around East Mt Tugg with the older kids. Then a few easy 100's barefoot with Karen. Cooler. 30 Mar 9.9 PH to Yacht Club then Central Basin with Chris and Michael in 59:21 (6:00/km). Strange that legs didn't feel good; various sore spots. Quite cool and windy. 31 Mar 6.8 Track, Calwell. 2.5k in 13:45. 6x300m with Karen easy (4:07/km pace). Felt better except slight left hamstring niggle. Good energy. Nike Frees - love 'em! 1 Apr nil Needed a day off. A few 9 hour+ working days made me tired this week. Writing this at 10am Saturday - a glorious sunny day, 20C. Pefect running weather. 2 Apr 14 Hot! A planned 'marathon pace' session. First 4k was Regatta Point CC race plus 6k to Duntroon (10k in 49:11). Then racewalked 4k back at 8:10/km. More. 3 Apr nil Lucky the marathon wasn't today! It was hot and windy at 10am. A nice ride on the 1400 to the Women and Girl's Fun Run then to Joy and Mal's. Week 13 48k - Not a good week. Down on sleep and too much on at work. 4 Apr 6.8 Speedygeese. Easy including 2 laps of exercise circuit. Push-ups, Sit-ups, Chin-ups, Dips. 40:54 of running time. Legs felt good. 5 Apr 9 Track, Calwell. 2.5k warm-up/down. 4x1000m - 4:48 4:38 4:30 4:31 (3min walk recov). Tried to run 'marathon pace' not looking at watch. Bloody hopeless! 6 Apr nil A two hour nap after work! Warm this morning - good for biking but not running marathons. Wrote in my other blog. Sore left knee, tight hammys. 7 Apr 7 Easy run with Chris and Ben past Tuggeranong Homestead, Isabella Plains then around through Chisholm in 40:03. Wore Nike Frees. Felt good, no problems. 8 Apr nil Well, forecast is not looking too good - 27C max on Sunday. Physically I feel fine but I need 2 nights of good sleep! Have tipped a 3:49 in Gramps' comp. 9 Apr nil Took Luckylegs for a blast on 1400 from race HQ out to Mount Stromlo. She was a good pillion and seemed to enjoy becoming a biker. Brilliant weather! 195 Race: Canberra Marathon. 681st in 4:37:39. Great day but I suffered in the heat. Felt good, half way in 1:47:33. First walk at 24k. Walked last 14k. Week 14 65k - Not a good marathon. A great weekend so it wasn't all bad! 11 Apr nil Well, for me, that was harder than the Six Foot Track. Was walking like an old man early in the day. Improved later. Achilles OK, left hamstring still tight. 12 Apr nil Hamstring slightly improved. Warm day. Some ungainly jogging between 200's on the grass at Calwell timing Courtney and Issie's time trials. They were good! 13 Apr nil Legs felt better but not normal. Very tired from work so it was lucky I wasn't running. Did some updating of running news on the SCT website. 14 Apr nil Could possibly have done a light jog but I made the mistake of turning on the computer. There was some news about Luckylegs on the CR Marathon Thread. 15 Apr nil Another day off. I'm just being conservative after the marathon. There was talk about hyponatremia on CR. Maybe I drank too much water prior to the race. 16 Apr 4.3 Easy run with Geoff over our new Fadden Pines courses. Not too bad. Changed my name on this blog back to 'Wombat' as Wombatface, being 3 syllables, is a bit formal. Don't give your children 3 syllable names! 17 Apr nil I plan to go for a light run on Tuesday. Ahead is another easy week. I want to be sure I'm recovered from the marathon and 6" for that matter. Week 15 4k - Six Foot + Canberra Marathon is a big ask for a lazy wombat. 18 Apr nil Left hamstring not 100% (can still feel some soreness/weakness when walking). Went for an easy bike ride down to Calwell track then to the shops. 19 Apr nil Hamstring felt 'normal', plus no 'nerve pain' on outside of left knee! A good sign. Bike ride down to Calwell track. Good talk from Mike for the Tassie kids. 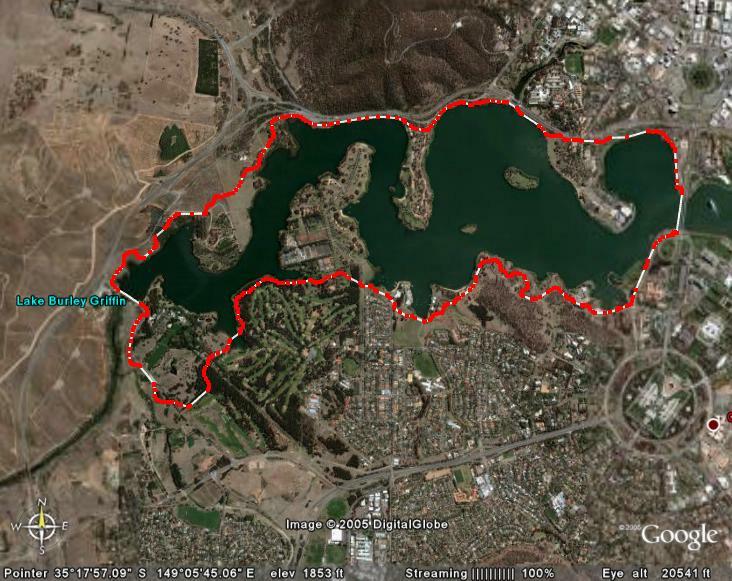 20 Apr 8.7 Easy run around Central Basin LBG with Chris, Graeme in 50:22 (5:47/km). Legs still feeling a bit second hand. Knee OK. Will take it easy for a while. 21 Apr nil Road the pushy down to Calwell. I'd decided yesterday not to do anything today. I'm glad because work has been busy and I've been pretty tired. 22 Apr nil Because, in my spare time I've been working on club stuff. This past fortnight was a good time for it as I've been in 'hibernation mode' after the marathon. 23 Apr nil Ride to Cambewarra. Too tired and busy to go for a run after arriving. 24 Apr nil Was going to run late in the day but Joss, Martin and family arrived unexpectedly for afternoon tea on their way back to Sydney from Mollymook. Week 16 9k - After 2 'rest weeks', it's time to start running. 126km last 4 weeks. 25 Apr 7 Out and back Hockey's Lane, right past Cambewarra Winery. 5:31 first km then 'solid'. 35:42 (5:06/km). Legs OK but still need work. Heart/lungs not OK.
26 Apr 8.5 From Calwell track, out/back with group towards Rose Cottage. 7.5k in 40:22 (5:23/km). Easy run but outside of left hamstring still not right. Warm! 27 Apr 8.2 Easy with Chris from Yacht Club around Central Basin LBG in 43:54 (5:21/km). Leg felt better than yesterday. Getting dark but still warm. A bit tired. 28 Apr 6.7 Calwell track. 2.5k warm-up 13:45 then 6x500m with Kate, 2:20 2:13 2:13 2:12 1:58 1:55, full recovery. Hamstring bothersome early but OK later. Warm. 29 Apr nil Could not run. Had to visit The Canberra Hospital to have my blocked oesophagus cleared. Had the operation about 4pm and stayed for observation. 30 Apr nil Checked out of hospital 11am and got a lift with Joy and Mal to my cross country race. Dave Osmond had it all organised. I just did the place tags. 1 May nil Was advised not to run for 48 hours. Sometimes I'm good at taking advice. Lunch at Kath & Steve's with Jim, Jane, Mal & Joy. A little cooler at last. Week 17 30k - A week that started well but finished less than well. 2 May 7.5 Speedygeese. Four laps of fitness track doing mainly push-ups, chin-ups and dips. Nike Frees. Left hamstring still niggly, otherwise OK.
3 May 7.1 Calwell track. 2.5k in 14:30. Last 300m of kids' 700s with 2:53 rests. 63 64 63 64 62 62 62. Frees. Legs good, lungs not. Fast warm-down with Kathy. 4 May 1.5 A slow jog around the new Fadden Pines cross country course. Didn't have time to do any more. 22 degrees today - who needs Queensland! 5 May 9.5 Calwell track. 7.2km with Kathy & kids Theodore loop at 5:20/km. Strongish. Then 5 laps on track fast straights, jog bends in 9:28. Tired. Brilliant sunset! 6 May nil Decided to do a long run out at the Cotter in the morning so a rest day was in order. The weather is still warm and dry. 7 May 25 8am: Cotter. Jellylegs, back via Wimps Way, 18.6km 1:41:20 (5:27/km). Felt good. 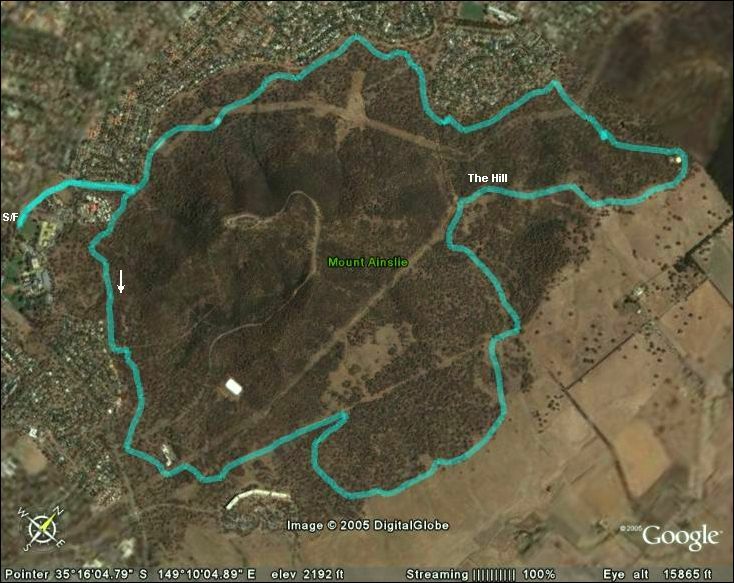 1pm: Race: CCC - Mt Ainslie 6km in 28:35 (4:46/km) 39th. Dusty, hot. Felt tired. 8 May 6.5 A look at the Australian Mountain Champs course. The most difficult I've seen for such an event. Much hard walking involved. To race it would not be fun. Week 18 57k - A better week. Felt amazingly good at the Cotter run. 9 May 7 Speedygeese. Same session as last week. Chin-ups and push-ups were easier. Quite tired so took the running bits easily. Not cold yet. 10 May 5.8 Calwell track. 2.5k warm-up 13:35. 6x550m 'hill circuit' fairly hard. Drills. Left shin quite sore so cut the session short. A hazard reduction fire sunset. 11 May nil Decided to have a rest day after yesterday's worrying shin soreness. I also needed time to write my report for our club's AGM and Awards night. 12 May 6.5 Calwell track. 2.5k warm-up/down 13:27/15:16. 5x300m, 4min recovery: 66.1 59.5 58.6 58.7 58.1. Last 300m of Al and Sophie's longer reps. Frees. 13 May nil Was thinking of doing a 6k easy run after work but it didn't happen. Instead of doing the 5k race tomorrow I think I'll run again at the Cotter. 14 May 19.4 8am - To summit of Mt McDonald (330m climb) then Jellylegs reverse in 1:48:52 (5:36/km). Ran with Carol and Chris. Felt good and strong. Warm. 15 May nil A bit sore from yesterday (shins, hamstring). Could have jogged a little but was a bit busy at Fadden Pines and after, processing the results. Week 19 38k - Track, Cotter were good. Volume down with 3 nil days. 16 May 7.5 Speedygeese. 8 x 'hill circuits'. Ran pretty easily. Left shin and hamstring sore. Donated blood - haemoglobin at 135g/L still lowish. 17 May 8 Including a lap of Majura ACT Mountain Champs course with Carol, 4.6km in 37:26 (8:09/km). How hard would 3 laps be?! Left shin still sore. Worrying. 18 May 9.6 PH to Yacht Club, lap Central Basin with Chris in 55:18 (5:46/km). Ran easily. Left shin no problem today! Hamstring still not quite right. Cooler. 19 May 2.8 Calwell track. 2.5k warm-up 15:20. 1x200m in 42.1. Was going to run 300m repeats but abandoned session due to a sore and restrictive left hamstring. 20 May nil I decided a day off might help my dodgy left hamstring. I'll resist sleeping in tomorrow and try a long run out at the Cotter. 21 May 23.9 The Cotter '15' in 2:13:05 (5:34/km). Cold at the start. Ran with Chris, Debbie, George, Steve & Cathy. Felt good. Hamstring not too bad. 22 May nil Felt a bit stiff so didn't run in the morning. Fadden Pines in the afternoon so ran out of time. T-shirt weather again! Warm, dry and still. Week 20 52k - Good Cotter run - need more of these. 177km last 4 weeks. 23 May 7 Speedygeese. 6 x hill circuit (564 metres). Ran fairly hard middle four, with Katie, about 10secs behind Colin and Trevor. Hamstring OK.
24 May 8.2 Calwell out/back to Conder mainly on dirt in 44:43 (5:27/km) watching A, D & S's fartlek session. Felt flat. Maybe yesterday was harder than I thought. 25 May 10.5 From PH with Chris to Comm Park then lap Central Basin with Cathy's group and back to PH in 55:54 (5:19/km). Solid middle 6k so probably too hard. 26 May 7.6 From Calwell up to railway then back through Gilmore tunnel with Ben, Al, Soph, R. At times 4:45 k's. Felt OK. Shin hurt a bit on last downhills. 27 May nil A rest day in view of the fact that tomorrow has the potential to be incredibly difficult. I hope my shins stand up to the downhills (the fun bit). 28 May 13.3 Race: ACT Mountain Running Championships. 2nd last in 96:42 (7:16/km). Not easy! John Winsbury 2nd male and Emma Murray running for SCT 1st female! 29 May 9 Masters' Farrer Ridge Handicap in 51:32 (5:44/km). Tried to run as easily as possible for recovery without being foolishly slow. Calves/quads sore. 6th last. Week 21 55k - An OK week. Enjoyed downhill bits of the Mtn Champs. 30 May nil Tired after a busy day at work, but the main reason for not running at PH was that my calves are tender to touch - much worse than yesterday! 31 May 5 Calwell track. Just jogged the 2.5k warm-up and warm-down. Tried 100m with a bit of pace but calves still too sore. I hope the easy jogging helped. 1 Jun 10.5 From PH with Chris to Comm Park, lap Central Basin at easy pace with group and back PH in 59:45 (5:41/km). Calves still a little sore. Quads fine. 2 Jun 7.4 Calwell track. 2.5k in 14:46. 8x300m, 92sec recovery: 69.6 67.8 66.9 68.2 66.6 67.6 65.8 66.8 - First and last 300m of Kathy's 1kms. 2.5k in 15:26. 3 Jun nil Rest day prior to the Cotter '18'. Yesterday was interesting -- The 300s were only 3:45/km pace but they didn't feel that easy. Not in Frees. 4 Jun 28.7 Cotter '18' in 2:44:54 (5:45/km). Borrowed shoes from Chris as I walked out of house in racing flats. Good run with Carol Baird, Chris. Tired up Vanities. 5 Jun 6.3 Ran in the parent/volunteer's race at Fadden Pines 2.5km in 11:23 (4:33/km), 23min warm-down with Geoff. Still feeling effects of yesterday's run. Week 22 58k - The 18 mile was a stretch. Missing Saturday racing. 6 Jun 7 Speedygeese. 5 x long hill circuit. Measured later with SCT wheel at 637m. Ran easily as still feeling tired from Saturday. Hills in 3:20 (5:14/km). 7 Jun 2.5 Calwell track. 2.5k warm-up with Dom in 14:33 - nothing else. Feeling unusually weak and tired. Hopefully it's just a one day thing. Warm - 19 degrees! 8 Jun 10.3 With Chris, Elizabeth PH to Comm Park, lap of Central Basin with Cathy's group in 55:33 (5:23/km). Felt much better today - could have run another 5k. 9 Jun 5.8 Calwell. 2.5k warm-up with Kathy in 13:28 (quicker than my normal). 20 mins continuous drills (hard). 8x200m easy with Karen. 2.5k wm-down 16:12. 10 Jun nil Well, I did feel a little guilty for writing 'nil' after not running hard intervals yesterday. A big Bush Capital and Range Road weekend to make up for it! 11 Jun 21.0 Part of Bush Capital Marathon in Goorooyarroo Nature Park. 1:58:01 (5:37/km). Middle 10k at 5:06/km. Felt great - no problems at all. Light rain second half. 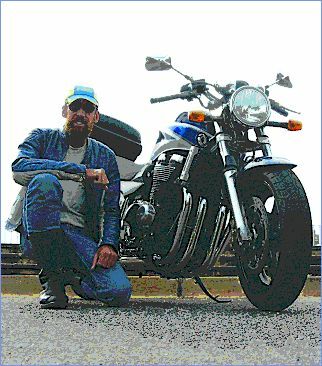 12 Jun 24.1 From Mittagong - Range Rd to Macquarie Pass Rd with Luckylegs and Tim. Mtn bike first/last 5km. Ran 24.1km in 3:11:20 (7:56/km). A tiring, beautiful day! Week 23 70k - A top weekend - felt strong Saturday, fine company Sunday. 13 Jun 7 Speedygeese. 6 x 637m hill circuit. 3:05 3:01 2:55 2:50 2:48 2:48 (About 2min recov). Felt good, ran hardish in last three behind Gary. 4:34/km pace. Rain! 14 Jun 8 Calwell Track to Tuggeranong Homestead, loop back to Richardson in 42:18 (5:17/km). With Sophie, Anne and Courtney. Middle kms were 5:00 or quicker. 15 Jun 11.8 From PH with Chris to Comm Park, Anzac Pde to Mt Ainslie (1k up walk track). 63:54 (5:25/km). Six of the kms were mid-4:50's. Felt good. Cold at last - 8C. 16 Jun 8 Calwell. 2.5k warm-up/down 14:57-16:16. 6x500m hill circuit with Karen, Dom, Anastasia. I didn't feel good (5:10 pace). Cold. Jupiter was near the moon. 17 Jun nil Rest day. I think I should be doing something today besides working on the computer. Too late now. Maybe next week it'll be a bike ride or easy run. 18 Jun 23.8 Cotter 15 mile with Cathy, Elizabeth, George, Maryann, Chris in 2:07:34 (5:22/km). Great weather! Ran hard - 7 of the kms were sub 5 minutes. Felt OK.
19 Jun 18 Terry Fox Fun Run in the middle of a long CB pace run wearing the Frees. 1:45:24 (5:51/km). Cold and raining. Ran the 10k in 58:20. No injury problems. Week 24 76k - Cotter 5 minutes better than the first one. 259km last 4 weeks. 20 Jun 7 Speedygeese. 6 x 637m hill circuit. About 3:30 ave. Felt terrible - no energy and weak. Disappointing as I wanted to run hard. Had to run easy. Cool, windy. 21 Jun 12 Recovery from Calwell to Banks via Conder bush track with Soph, Kate, Al, Ben, Chris and Darryl. 69:41 (5:48/km). Felt much better. Finished in rain. 22 Jun 10.2 From PH to Comm Park, lap of Central Basin with Cathy's group in 54:20 (5:20/km). A couple of kms at 4:59. Cool 5C. Felt OK. Petzl light worked well. 23 Jun 4.85 Calwell off due to flooding from Curtin. Ran a street course from home in 24:26 (5:02/km). Hardish middle 2km of 4:51, 4:35. Both achilles a bit niggly. 24 Jun nil Was going to do something but got stuck on the computer again. Have decided to run the 10k race tomorrow as it will be less tiring than the Cotter. 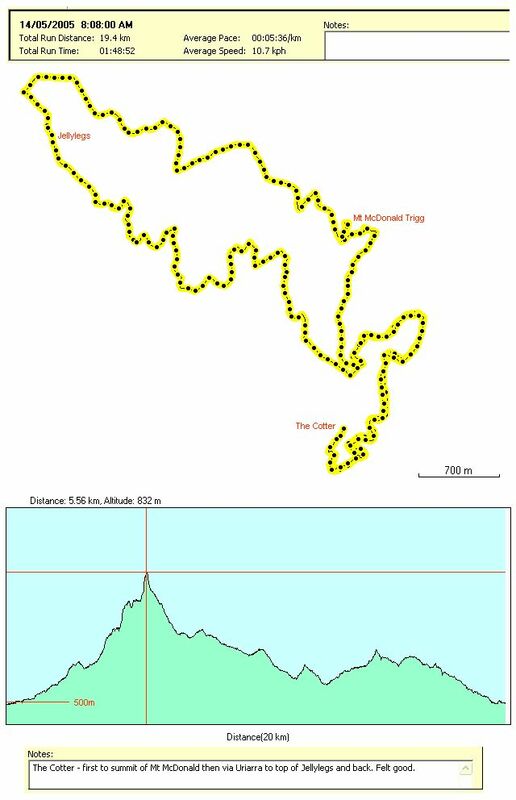 25 Jun 13 Race: Molonglo bike path. Runners Shop 10k. 60th in 44:55 (4:29/km). Started a tad fast. 21:31/23:19. Fastest km 4:12, slowest 4:39. Lacking race fitness. Achilles OK.
26 Jun 9.4 Pennant Hills 4pm. A small group including 'The Legend' (Keith Mayhew). No Fast Kath! A great bush run down and up some good hills easy in 56:24 (6:00/km). Week 25 56k - The 10k race was hard. Don't have much speed in the legs. 27 Jun nil After seeing my sister off (to the USA) drove to Taree. Arrived after dark. Pretty weary so decided not to run. Start of 'the rain'! 28 Jun nil Drove to Pottsville in the rain arriving about 4:30pm. A late afternoon tea with Dad and Marion. 29 Jun nil Rain, rain, and more rain! Some local flooding. Didn't feel like going out for a run as the rain was horizontal at times. Stayed in the wombat hole. 30 Jun 11 4pm. Rain finally stopped! Around the streets of Pottsville checking the drowned servo and floating outdoor furniture. 58:53 (5:21/km). Felt sick - ate late. 1 Jul nil To Coolangatta then Surfers! Checked in at 'Pacific Views'. Room 58, 21st floor. Planned to meet Chickybabe and Slow Sue for a beach walk but we got lost! 2 Jul 5.2 7.15am. Easy run with Jennifer north on The Spit bush track then to Seaworld in 31:00 (5:58/km). Great weather! Felt OK. The bush track was flooded! 3 Jul 21.1 Race: Gold Coast Half Marathon. 813th in 1:41:57 (4:50/km). Ran with Pat Carroll's 'green ballon man' until 10k in 47:52. 49:00 next 10. Not great. Not easy. Week 26 37k - Gold Coast was great! Fun meeting some new CoolRunners. 4 Jul nil Drove from Surfers to Taree. Stopped at Urunga for afternoon tea with Anne and Graham. Mal and Joy were visiting on their way up to Maroochydore. 5 Jul nil Drove from Taree to Canberra. Met Bruce at Chatswood for lunch at the good Chinese place in the food court. Tired when I arrived home about 5.30pm. 9.3 AM: To work on bikepath in 47:48 (5:50/km). Felt stiff and zombie-like. PM: Home on trails 55:40 (5:59/km). The flat bits good.. the rest a bit ugly. 8.8 AM: To work via Johnson Drive in 45:38 (6:05/km). Shorter but hilly. OK.
PM: Home on bikepath in 53:30 (6:05/km). A stop at Calwell track on way. 8 Jul nil Felt very tired when I woke up so I cycled to and from work instead of running. Will need good sleep if I'm to keep up this running to work idea. 9 Jul 23.8 Cotter '15'. Only Michael Freer was there. Ran in reverse (steep hills). 2:09:20 (5:26/km). Wet. Vanities thigh deep. 20cm at Cliff Rd and Padovans. Felt OK.
10 Jul 6.4 5pm - easy run on trails around Conder trying new Asics wet weather gear from the Runners Shop. 38:20 (6:00/km). Legs felt a bit ordinary and tired. Week 27 64k - Have recovered surprisingly well from the Gold Coast. 7.2 AM: To work on road in 41:05 (5:33/km). Better without backpack! Good. PM: Home bikepath and trails in 41:27 (5:45/km). Weak on hills. Very tired. 10.2 AM: To work shortest way in 39:16 (5:51/km). A frost. Minus 3C. OK.
PM: Home via Calwell track in 57:00 (5:35/km). 5th kilometre was 4:57! 10.2 AM: Road/bikepath in 39:35 (5:34/km). Felt amazingly good. Cold, rain. PM: Long way in 58:30 (5:44/km). Not pretty after a long day at work. 8.3 AM: Steps and extra bit at end (5:56/km). You can run while sleeping. PM: Via Tuggeranong Homestead C track (5:46/km). Didn't mind how slow. 15 Jul nil Rode the Apollo instead of running. Tried a different way home which should be good for running with one 'easy' hill and about 1km of dirt. 16 Jul 24 Cotter '15' in 2:17:32 (5:43/km). An easy run with Chris. Slow on the uphills. Felt somewhat tired and both achilles were niggly. A cool wind blowing. 17 Jul 9.2 Ran to Calwell then home the hilly way on the Theodore fire trail. 48:52 (5:18/km). Felt pretty good. Achilles were OK. Lots of snow on the Brindys! Week 28 97k - A new improved appreciation of sleep! 254km last 4 weeks. 7.2 AM: New way in 39:49 (5:31/km). Woeful, creaky first 2km then quickish. PM: Home same 42:17 (5:52/km) with 5kg backpack. A very tired shuffle. 8.3 AM: 38:47 (5:32/km) Uphill start 7:26km! Ice covered puddles. Minus 4 C.
PM: Home via Conder trail in 46:30 (5:36/km). Achilles and heels sore. 20 Jul nil Rest day today instead of Friday to give the heels a break. Rode Apollo to and from work. Cycling is colder than running! Takes about 25 minutes. 8.5 AM: 34:37 (4:57/km!) First km 5:59. Quick for warmth, Frees. Full moon. PM: Home via Calwell track in 47:54 (5:36/km). After a long work day. 8.5 AM: 37:20 (5:11/km) Bad start turned into something quite good. Foggy. PM: Home via Bonython, Gordon tracks at 5:38/km. Just A to B stuff. 23 Jul 8.3 Around Theodore mainly on fire trails hilly in 43:54 (5:18/km). Ran after helping at the SCT BBQ for the ACT Cross Country Championships. Felt tired. 24 Jul 21.2 Steady out/back to Fadden via Gilmore and Macarthur trails in 1:56:23 (5:29/km). Felt OK except for the last 3km. Sunny but a cool breeze. Achilles OK.
Week 29 90k - Feels like I'm in the second week of Le Tour. 9 AM: 40:09 (5:43/km). Warm 11C. Felt bad, like the English Test Team. PM: Slow via Conder (5:57/km). Like a dead dog lyin' in a ditch. 10 AM: Bikepath in 42:39 (5:19/km). Headwind. That dog got up and ran. PM: Easy via Gordon 'Lake', Conder trails (5:44/km). A recovery run. 27 Jul nil I was going to 'run to school' and have a rest day Friday but felt tired so had 20 mins extra sleep and rode the Apollo. 3 degrees. A half moon lit my way. 10.1 AM: Trails first 2k slow then bikepath in 39:48 (4:58/km). Felt good! 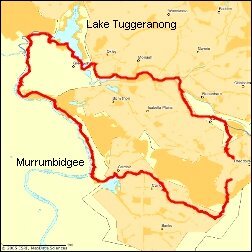 PM: Home via Murrumbidgee River trail (5:44/km). Saw a wombat hole. 29 Jul nil Both heels (esp left) and achilles sore on waking so I decided to ride the Apollo instead of running. A little worried about how they'll be in the 16k bush run. 30 Jul 16 Race: Bush Capital 16k. Found it hard to get going. One big hill. Last 4km slow. Heels were OK, Brooks shoes. Finished 14th in 79:49 (4:59/km). 31 Jul 6.5 An easy flat run Theodore/Calwell at 6pm after driving back from Cambewarra (5:54/km). Left hamstring a bit tight. Heels were OK. Lacking energy and tired. Week 30 75k - Bush Capital race enjoyable. Heels a worry. 7.3 AM: Ran fairly easily in 44:52 (5:37/km). Left hamstring felt weak. PM: Home at 6:03/km. Absolutely knackered mode. Not good. Warm. 10.3 AM: Bikepath 42:46 (5:20/km). Felt like I was running in mud. Foggy. PM: Riverside 59:12 (5:45/km). Tired but a top day! T-shirt, 14C. 3 Aug nil Very tired so rode the Apollo Kosciusko to and from work. Have a sore spot on back left side of left heel. It's a bit red and inflamed. Hurts when pressed. 4 Aug 6.8 AM: To work short, hilly 36:51 (5:25/km). Heel bearable. Half asleep, light rain. Was going to walk home but caught a tempting bus instead (ran to catch it). 5 Aug 8 AM: Theodore track, Calwell hill then bikepath in 41:19 (5:09/km). The best I've felt this week. New Brooks Radius shoes. Used Feldene Gel on the heel. 6 Aug 14 Race: CCC 8k Goorooyarroo. 48th in 37:53. FM said 8.24k, so 4:35/km. Easyish 4.1k warm-up 22:52. 1.7k after with Geoff. One 'on ramp', many 'speedbumps'. 8.3 AM: Easy out/back track near drain plus Tugg Homestead (5:46/km). PM: With Geoff M after Fadden Pines bike path slow, tired (6:04/km). Week 31 79k - Heel settled. Yahoo for race at Goorooyarroo! 8 Aug 9.6 Speedygeese. Just many laps easily in 55:45. Left hamstring a bit dodgy. Tired and flat. Didn't Mal once say Monday's are not meant to be easy? 7.2 AM: Slow early then good 37:00 (5:08/km). Flat bits were 4:40's! PM: Same course 41:40 (5:47/km). Didn't want to wait for the bus. 9.2 AM: Big inertia problem. Cold, wet and windy in 38:54 (5:20/km). PM: Home via Tuggeranong Homestead at 5:54/km. Snow flurries. 11 Aug 6 Calwell track. 2.5k warm-up 15:16. 10x100m at an easy pace. 2.5k warm-down with Kathy 13:07! A cold wind blowing off the snow. Left hamstring felt weak. 12 Aug nil A walk (about 4k) with Bruce and Gordon down to Artarmon Park. Didn't feel that great. Had an excellent meal at the Japanese place near the station. 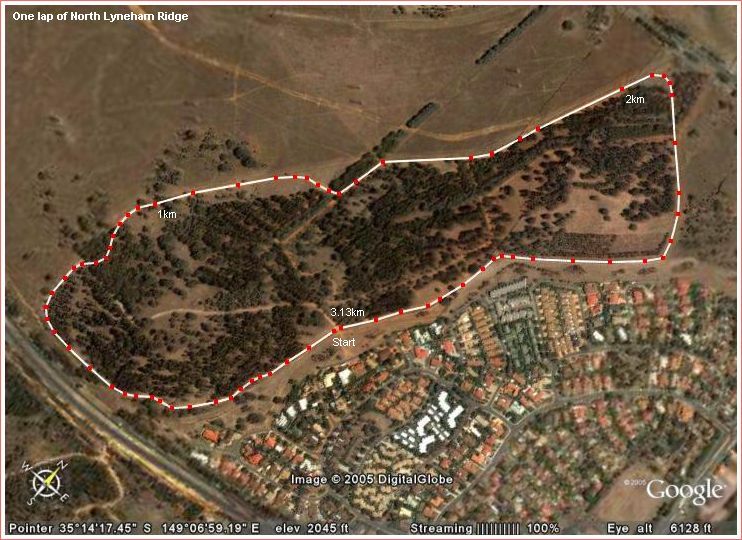 13 Aug 8.2 Easy run with Gordon 9am through Flat Rock Creek reserve. A bit of bush bashing, steps and walking. 56:19 (6:51/km). 5k walk to Chatswood in afternoon. 14 Aug 14 Race: City to Surf - 3,216th in 66:35. Slow start. 3k 14:17, 5k 24:10, 7k 35:14, 10k 48:58. Left hamstring was bothersome the whole way. A perfect day. Frees excellent! Week 32 69k - C2S... heel OK, hamstring not. 313km last 4 weeks. 15 Aug nil Rode the Apollo to work. Didn't go to Parliament House as the hamstring was still sore and I decided a rest day would be more beneficial than easy jogging. 16 Aug nil Hamstring was much improved but still not 'perfect'. Have started doing the exercises suggested by Karen and Kathy. Tired because work was very busy. 17 Aug nil Rode the Apollo. Didn't have time to try a run as I had to drive to Kath and Steve's at Belconnen for Joy's birthday party at 6.30pm. Great weather! 18 Aug 8 Track Calwell. 2.5k warm-up 14:20. 3x1000m 4:20, 4:21, 4:19, full recovery. Hamstring was 'sort of' okay. Good to try some track. 2.5k warm-down 13:28. 19 Aug nil A bit of an argument with myself about whether I should do an easy run. Tired from work. Planning something long in the morning. Silly leg not too bad. 20 Aug 15.5 3pm. West Basin LBG bike path in 81:16 (5:15/km). Hamstring much improved from last Sunday. Pushing a bit but not smooth. Windy, 12C, wore a T-shirt. 21 Aug 10 Masters' 7k Urambi Hills handicap as a recovery run in 41:31 (5:51/km) plus 3k very slow afterwards. Legs not working this morning. A very stilted shuffle. Week 33 33k - Hamstring improved with some days off. 22 Aug 9 Speedygeese. Hamstring less than brilliant, plus occasional clicking behind left knee. Ran easily, so that's two recovery days in a row. 23 Aug 12.5 Calwell, 2.5k warm-up 13:33 with Ben, Sam, Dom. 10k alone out/back towards Rose Cottage in 51:57 (5:11/km). Hamstring OK but not on uphills. 24 Aug 9.5 Apollo to and from work. PH with Chris, one lap Central Basin LBG in 53:08 (5:34/km). Easy. Hamstring OK, main problem was pain behind left knee. 25 Aug 2.5 Calwell. 2.5k warm-up in 14:04. Was going to do a moderate interval session but the tendon behind my left knee was niggly so I decided against it. 26 Aug nil Struggled to get out of bed after bowling with the Masters last night. Rode the Apollo. A long day at work and tired when I got home. Sore right hip. 27 Aug 6.6 Race: CCC North Lyneham 6.2k. Felt rusty. 16th in 30:11 (4:52/km). Hamstring OK, left knee OK except for the uphills. Splits 14:55/15:16. Warm. 28 Aug 17.3 Planned 12k 'out/back' but out of petrol at 14k. Coasted to a stop at 17.3k (5:39/km). 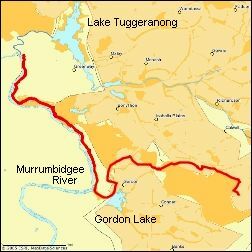 The great Murrumbidgee River track. A bit sandy in places. Warm. Week 34 57k - Not running well. I've fallen in a wombat hole. 29 Aug 8.5 Speedygeese. 23mins on lower trail. Diagonal 'flagpole' sprints on grass. My 'left knee tendon problem' is restricting speed. Lap warm-down. 30 Aug 2.5 Calwell. Warm-up easy in 14:20. Decided not to run. Karen wasn't there (a meeting). I was tired, suffering a bit from hayfever. Rode Apollo to/from school. 31 Aug nil Had a late day at work. After arriving home I felt too tired to run. One good thing is that my 'left knee tendon problem' is feeling improved today. 1 Sep 5 Calwell. 2.5k warm-up 15:07. Drills - 'push off' forwards/backwards cones with Karen and Siobhan. 2.5k warm-down in 12:45! with Kathy and Anne. 2 Sep 7 'Ran to school' in 35:47 (5:06/km). Glad I did as I was buggered after work and have Mal's b'day party tonight. Left hammy/knee thing on uphills. 3 Sep nil Didn't get up early enough to run in the morning. Afternoon helping with SCT teams at the Yarralumla Relays. Both our men and women's teams won! 4 Sep 23 1.30pm. Down to the Murrumbidgee River track, back via bike paths, Tuggeranong Homestead in 2:11:02 (5:41/km). Felt better than last Sunday! Week 35 46k - A bit slack for mileage. Silly leg still a problem. 5 Sep 16 7k home from work in 45:20 (6:29/km). A bad run, legs tight. 5.30pm 9k at Parly House easy - stride now slightly longer than one foot. 54:18. 6 Sep 7 Track, Calwell. 2.5k in 14:28. Barefoot 5x400m: 97.7, 97.6, 93.8, 92.6, 90.9. Leg OK, a bit out of breath. 2.5k with Kathy, Marlene in 14:25. Mild, still. 7 Sep nil Rode the Kosciusko to and from school. A perfect day for the ride home. Plenty of ducks on 'Lake Isabella'. Saw 2 roos. Legs felt pretty good. 8 Sep 5 Calwell. Just warm-up 13:55 and warm-down 14:33. Started some strides but top of right foot was sore. It felt fine during the warm-down! Legs good. 9 Sep nil Was feeling tired after work (up too late last night watching the cricket), so decided not to run. Off to Sydney via Mittagong in the morning! 10 Sep nil After checking in at 'The Vibe', Milsons Point, went for a huge long leisurely walk with Luckylegs down to the Harbour. A bit too much I think. 11 Sep 21.1 Race: Blackmores Sydney Half Marathon. Official 1:50:52 (5:15/km). Slow start, neg split. Felt good in middle stages. Mild, some rain. Leg no problem. Week 36 49k - A brilliant weekend - all good! 185km last 4 weeks. 12 Sept nil Feeling like a really, really, REALLY old man this morning! Both legs stiff, top of right foot sore. Started writing my Blackmores Half story. 13 Sept 7 Track, Calwell. 2.5k in 15:32. 10x200m very easy behind Karen and Sam (56.1 ave). 2.5k in 14:47. Legs still quite tight. Foot not bad. Cold, windy. 14 Sept nil Rode Kosciusko to work. Legs improved. Was to do club work instead of running but fell asleep on the couch! Chip time for the half.. 1:47:37 (5:06/km). 15 Sept 7.1 Track, Calwell. 2.5k in 14:28. Frees. 7x300m averaging 67.8 - Left knee tendon thing restricting my speed. Out of breath. 2.5k in 14:52. Cool, windy. 16 Sept nil Just didn't feel like running this afternoon. How slack is that?! All the niggles feel OK walking around. Might do a little run in the morning. Cool. 17 Sept nil Sore back after packing Canberra Times finisher bags for 3.5 hours. Walked 2 miles with Mike in the afternoon measuring the SCT Golden Mile course. 18 Sept 11 Race: Canberra Times 10k Fun Run. 44:03 (4:24/km). Good conditions. Frees. Lacking speedwork this year. 5k splits 22:22/21:41. Mild, sunny. Felt good. Week 37 25k - Not running as well as I was this time last year. 19 Sept 9.5 Speedygeese. A long warm-up, then steady running around the square, striding out a little at times. 60:02. Legs felt OK. Knee good. 20 Sept 2.5 Calwell track. 2.5k warm-up 14:42. When I tried fast running the left knee problem came back. Decided not to do anything. Slight hamstring tightness. 21 Sept nil Had a minor bike accident where I put my foot down awkwardly and jarred my left leg. Quite sore high on left shin below the knee later in the day. 22 Sept 6.8 Track, Calwell. 2.5k 15:06. DS Trainers. 6x300m with Sam & Karen 69.9 66.1 64.8 64.4 61.6 62.7. Once up to speed the knee was OK. 2.5k 15:25. 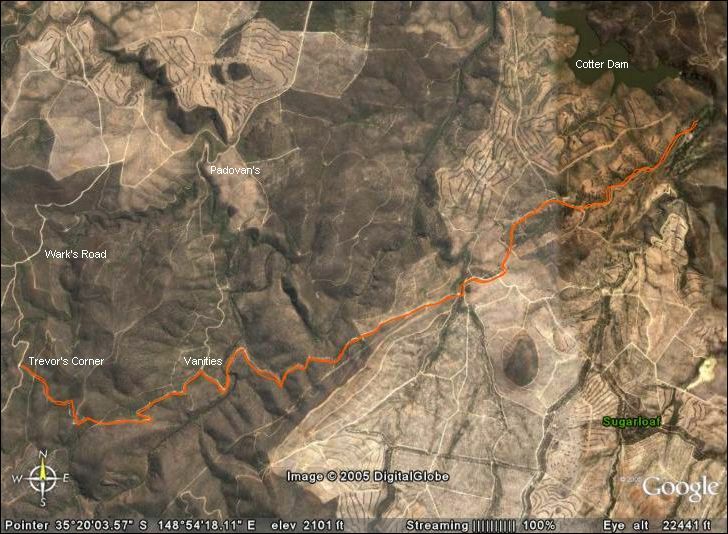 23 Sept 11 Recovery run on Theodore tracks then up Cooma highway and back on dirt in 62:52 (5:42/km). Short stride to stop left knee tendon problem. Warm! 24 Sept nil Slept in so missed the Cotter. In any case, the left knee was quite stiff so I thought I'd give it the day off. A great victory by South Melbourne! 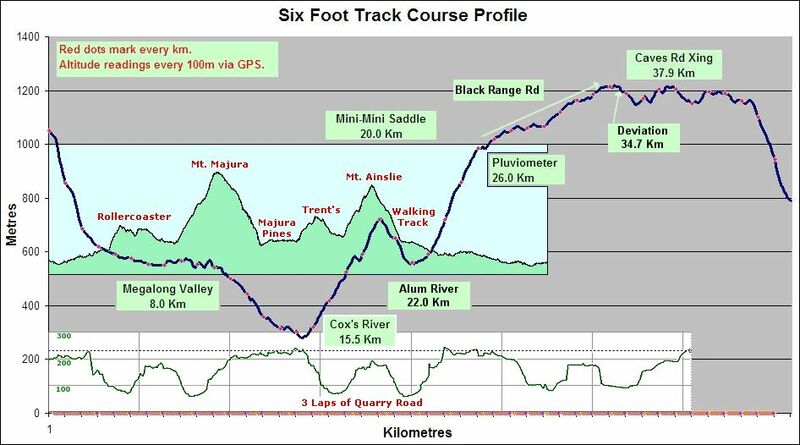 25 Sept 18 Masters' Handicap then to Mt Stromlo to make it a long run, 1:42:26 (5:41/km). Knee and leg OK, achilles a tad sore. Just felt out of shape and sluggish. Week 38 48k - Track session & Sunday good. Out of shape! 26 Sept nil Rain and thunderstorms. Didn't go to PH as I had emails to write and time got away. Leg and knee feeling fine. An easy run would have been good. 27 Sept 8 Track, Calwell. 2.5k with Ben 13:16. 3x1000m barefoot 4:33, 4:20, 4:16. The knee kept stride short. Sore left shin. 2.5k warm-down 14:02. Mild. 28 Sept nil Had a late day at work and was too tired to run by the time I got home. My left shin was sore during the day which is a bit of a worry. 29 Sept 6.4 Track, Calwell. 2.5k warm-up 14:59. 6x200m easy in 60 + 200m in 43. Shin, leg and knee not too bad. 2.5k warm-down 14:31. Cold and windy. 30 Sept nil Late day at work - too tired to run. I've been thinking that I shouldn't run if I've worked for more than 10 hours (unless it's a short, slow run). 1 Oct 19.2 8am Cotter to Trevor's Corner, back with Steve Appleby in 1:57:06 (6:06/km). Also, Elizabeth, Chris and George. Felt OK. Mild. Vanities was 0.6m and cold! 2 Oct 5.5 Recovery run on Conder bush tracks. Rough and slow first few kilometres - gradually felt better. 33:12 (6:01/km). Warm - great weather! Week 39 39k - Good run at the Cotter. Need more 1k sessions. 3 Oct 10.1 Sri Chinmoy 10k. Fairly solid first 5k chasing FD, PH and AR then steady running. 52:47 (5:14/km). A warm stunning morning. No injury problems. 4 Oct 6.5 Track, Calwell. 2.5k warm-up 15:20. 5x300m with Karen 74.9 74.4 72.4 72.1 69.2. Tired. Left knee tendon niggly. 2.5k warm-down 14:45. Mild. 5 Oct 11 From PH to Floriade then a lap of Central Basin with Cathy's group. Included a couple of quick kilometres. 58:52 (5:21/km). Left knee still niggly. 6 Oct 7.5 Track, Calwell. 2.5k in 14:56. 5x500m with Karen 2:05 2:01 1:58 1:57 1:54. Frees. 4 mins recov. Knee not hurting! Mild. 2.5k warm-down 14:55. 7 Oct nil A rest day! Running at the Cotter in the morning. Would have done something short but felt too tired after a long day at work. 8 Oct 22.6 8am. Cotter to Trevor's corner with Steve, back via the 21 mile loop. 2:17:25 (6:04/km). Felt OK. Windy, cool. Vanities Crossing down a bit. 9 Oct 12 Recovery run to the Tuggeranong Railway Station. Very cool wind blowing. Both hamstrings tight at the start but improved during. 70:40 (5:53/km). Week 40 69k - Best thing was my knee on Thursday! 181km last 4 weeks. 10 Oct nil Didn't have time to run after work. Jim's birthday dinner at 6.30pm - Sue's Kitchen at Page. 11 Oct 8 Track, Calwell. 2.5k in 14:52. Tired from a long day, so 2x1500m 'steady' 6:51.3, 6:36.8. 6 mins recovery. Frees. 2.5k warm-down with Kathy 13:20. 12 Oct 11.5 From PH with Chris, joined Cathy's group for a run around Central Basin. 62:29 (5:26/km). Didn't feel smooth. Both heels a bit sore. Windy. 13 Oct 6 Track, Calwell. 2.5k in 14:21. 8x hills. Tried a 200 but terrible. 2.5k warm-down 15:27. A bad idea to try a hard session. Much too tired. 14 Oct nil Too tired after a long day at work. 15 Oct 16 Cotter. Started at dirt. To Jellylegs with Graeme, Stuart then back a bit harder with Chris including Mt Macdonald. Saw brown snake, wombat. 16 Oct nil Flew to Melbourne after yesterday's run. Drove to Phillip Island to watch the MotoGP with Mal, Jim, Adam and his friend Jessica. Good weather! Week 41 41k - A very slack week for kilometres. Need to do more! 17 Oct 8.5 Speedygeese. Long warm-up. Using the (long) grass down the front, ran 12x150m following Colin. Moderate pace. Normal warm-down. 18 Oct 8.8 Track, Calwell. 2.5k warm-up 13:57. Ran 8x 475m hill circuit fairly hard (5:14/km average pace). 2.5k warm-down 15:13. Windy, cool. Felt OK.
19 Oct nil Felt too tired after a long day at work. Running my first track race for a while at the Masters tomorrow. 20 Oct 5.8 Race: 3000m - 13th in 12:32.59. Frees. Not enough warm-up. Not easy! Splits 4:07, 4:13, 4:12. Not fit. Mild and still. Track wet. 1k walk in 5:06. 21 Oct nil Did not run. Should have. 22 Oct 15.6 From home to NSW (other side of Cooma Railway). Some harder running at times. Tired in the last few kms. 87:18 (5:35/km). Quite hilly. Warm. 23 Oct 16 9.45am. Out/back 8k on Brindy Classic course with Karen. 1:51:24 (6:57/km). Easy pace. Warm. Felt okay except for sore big toes. Emma amazing! Week 42 55k - Not very fit. 12-something for a 3k track race! 24 Oct 7 PH underground carpark (353m lap). 8 lap warm-up. 8 laps fast uphill. 4 lap warm-down. Geoff, Colin, Trevor, Ken, Dale, Michael and Margaret. Storms. 25 Oct 8.3 Track, Calwell. 2.5k in 14:33. 11 x 300m ave 71.2 with 1:30 walk recovery. First few were slow. Sluggish. 2.5k in 14:19. Wet grass and a rainbow. 26 Oct 13.5 From PH, then with Cathy's group around Central Basin, ran the long way back. 72:25 (5:22/km). Good middle, bad ends. Wet ground and humid. Pollen. 27 Oct 6.5 2.5k warm-up Calwell in 15:14. 4k at Masters including 2 with Aki. Legs still very stiff so I decided not to race. Cleared 1.30m in the high jump which was OK.
28 Oct nil Had a late day at work. Also, needed to get ready for Kathy's birthday. She has a huge number of candles and needs help to blow them all out. 29 Oct 16.7 Cotter to top of hill after Vanities. Ran with Chris (not fit) and Elizabeth (very fit), some waiting for Chris. 1:39:12 (5:56/km), OK. Warm. River deeper. 30 Oct 14.5 Masters' handicap Blewitt's Cows 7.1k in 41:09 (5:47/km). Legs creaky from yesterday's run. Then 7.4k Mt Stromlo with walks in 50:40 (6:50/km). Wet. Week 43 66k - Not happy I missed racing on Thursday night. 31 Oct 9.5 Geoff's Parly House. A slow lap beforehand. About 6x538 metre loop including sprint lap of grass field. 60:50. Legs felt tired and sore. Very humid. 1 Nov 8.7 Track, Calwell. 2.5k warm-up with Kathy in 12:56! Another with Karen 15:47. 6x200m with Karen 51.2 47.1 46.3 45.5 46.1 43.8. 2.5k 15:26. Wet, humid. 2 Nov 10 With Chris from PH to Cathy's group then lap of Central Basin. 5:35/km pace for CB, to/back slower. Felt OK, easier than last week. warm, humid. 3 Nov 7.9 Race: 3000m - 14th in 12:21.06. Frees. Felt good. Beat Jim! Splits: 4:03 4:11 4:07. Calwell warm-up in 15:42. Also, 2k walk in 11:12. Humid, track wet. 5 Nov 26 Race: Mt Majura Vineyard Two Peaks 26k. Finished 36th in 2:41:00 (6:11/km). Walked most of the two speedbumps. First 20k good. Felt OK. Humid. 6 Nov 10 Flat to Isabella Plains via drain 62:06 (6:13/km). Almost turned back after 1k as stride length was about 1 foot such was the tightness in my legs! Week 44 72k - 3000m promising. Better miles. 234km last 4 weeks. 7 Nov 4.9 Half way through PH training my left calf did something. Like a bad cramp high up. Sore when walking back to the car. Have iced it. A bit worried. 8 Nov nil Calf much improved. Decided not to run as being healthy for the slow 6 foot is a priority. One short 50m jog (in jeans) on the grass at Calwell. 9 Nov 7.4 From PH, joining Cathy's group, lap Central Basin, short way back. 43:52 (5:56/km). Calf thankfully, not a problem! Very warm at 28 degrees. 10 Nov 3 Race: 3000m Walk. Pleased with 17:07. Splits 5:40 5:46 5:41. Decided not to test calf with any running. High Jump 1.25m off a short run-up. 11 Nov nil After spending two hours mowing the grass I decided I'd had enough exercise. Don't want to be too tired before tomorrow's long run. 12 Nov 23.9 Cotter '15' with Steve, Elizabeth in 2:16:08 (5:41/km). Good pace. Hills fine but tired last 3k. Enjoyed run - no injury problems. Vanities 0.7m deep. 13 Nov nil Legs a bit sore from yesterday so I decided to have a rest day. Only exercise was washing the car. Week 45 39k - Good race walk. Enjoyable Cotter run! Low miles. 14 Nov 6.2 Speedygeese. Same circuits as 31/10. Tried to stay with Trev & Ken but 30m or so behind on each rep. 3x538m/ 3x622m. Ave pace 4:37/km. Good. 15 Nov 7.1 Track, Calwell. 2.5k with Kathy 13:19. 7x300m (3min ave walk recov) - 66.7 69.1 64.2 65.8 67.7 64.3 65.1. Good as very windy! Cool. 2.5k 14:14. 16 Nov 12.2 A Bad Run! From PH around Central Basin including half Mt Ainslie with Chris in 76:22 (6:16/km). Legs not working. A slow shuffle the whole way! 17 Nov 8 Race: 3000m Walk. Very happy with 16:33! Splits: 5:28 5:29 5:36. Good race with Anne and Lachlan. 1.30m High Jump. 4k warm-up at Calwell earlier. 18 Nov nil A rest day prior to the Cotter 15. Feeling fairly good physically. Injuries have settled. I think walking rather than running yesterday helped. 19 Nov 24.3 Cotter with Steve, Elizabeth in 2:41:02 (6:37/km). Refreshing swim in Vanities. Decided to walk home from there as practise for next week. Warm. 20 Nov nil Didn't have time to run. Drove to and from Cambewarra for Dad's 80th birthday party. Arrived home late and tired. Week 46 58k - Some good (2nd fastest 3k walk), some bad (Weds). 21 Nov 7.5 Speedygeese. Included 4x700m hill loop but ran the whole session at 'steady' pace. Not pushing at all. Included sit-ups, push-ups and chin-ups. OK.
22 Nov 9.9 Calwell. 2.5k warm-up with Sophie, Em in 13:07. After training ran to railway through Melrose Pines easy in 41:48 (5:39/km). OK. Warm then cooler. 23 Nov 13.3 From PH with Chris, then lap Central Basin with Cathy's group (5:11/km) back via Yacht Club. 71:30 (5:23/km). Felt good at times. Cool and windy. 24 Nov 3.6 Calwell. Ran a longer warm-up with some of the kids and Kathy on the Theodore trail. Easy. Legs a bit tired from yesterday. Very cool and windy! 25 Nov nil Drove to Katoomba. 26 Nov 45 The Six Foot Track - Slower Version. Our running time was 8hrs 13mins. Total time 11 hours 4 minutes. A very memorable day! The details are here. 27 Nov nil Peter keen but best not to run after eating too much bacon and eggs for breaky. Also raining and didn't want to fall asleep on the drive home. Week 47 79k - The SFTSV was a very special weekend. Brilliant! 28 Nov 7 Geoff's Parly House. After warm-up, 8x hill loop east side. Ran very easily. Still some fatigue but no specific sore spots. Blister OK. 42:55. Light rain. 29 Nov nil Decided on another rest day. Only four of us at Calwell (Mike, Ben, Courtney). Many of the group competing at the Pacific School Games. Cool, breezy. 30 Nov nil Chris was unable to run so I continued writing about what happened during the 'Six Foot Track - Slower Version'. 1 Dec 3 Race: 7-lap 'Spiral Handicap'. Race-walked it. Bad fade in the last 3 laps. 2,957 metres in 17:39 (5:58/km). High Jump in 1.30m again! 2 Dec nil Planned a late easy run but a nasty storm arrived so I stayed indoors. 3 Dec 24.3 Cotter '15' including summit Mt McDonald in 2:28:54 (6:08/km). Slowed badly 2nd half! Weary, sore right hamstring. Some good Six Foot tips from Carol. 4 Dec nil Yesterday's run was pretty draining. Thought about going to high jump training with John at the AIS but couldn't spare the time. In two weeks maybe. Week 48 34k - Recovery week. Missing the track. 210km last 4 weeks. 5 Dec 7.8 Geoff's Parly House. Warm-up, 8 x 412m east hill loop off 3 minutes. Ran middle 4 fairly hard. Felt much better than last week! 46:45. Warmer at last. 6 Dec 12.2 From Calwell track to old Tuggeranong Railway Station platform. 71:22 (5:51/km). Caught in brief storm. Legs feeling yesterday's hard session. 7 Dec 10.5 PH to swimming pool bridge then a lap of Central Basin and back in 58:16 (5:33/km). Steady pace, could have run faster. Tomorrow maybe? Hot. 8 Dec 3.5 Race: 2000m Walk in 10:50. Handicap start. Good race with Ann and Robin. Had planned to just run the 1500m but legs way too stiff in warm-up. 9 Dec nil Pretty tired from work. It would've required a major inertia shift to get out the door... also, I know Steve has a long, nasty run planned for tomorrow. 10 Dec 28.2 Cotter: Mt McDonald, then '15' to Pierce's River (good), then New Pipeline Rd (bad). Walked last 7k. 3:13:46 (6:52/km). Big headwind on Bullocks. 11 Dec 6.1 7pm. Steady run both sides of 'Melrose River' crossing at Calwell Shop's bridge in 32:34 (5:20/km). Slow, stiff first half, okay second half. Week 49 68k - Not happy to miss the 1500m race! Long run half OK.
12 Dec 8 Speedygeese. 6 x 670m west hill loop in about 3:40 (5:28/km) off 5 mins. Ran easily. Felt okay at first then tired. Long working day? Saturday? Humid. 13 Dec nil Helping to organise SCT's teams for the Parliament House Relays. We won! I was considering running 10k or so afterwards but it was getting late. 14 Dec nil A very late working day. Tired!! Yes... two exclamation marks! 16 Dec 5.8 'Steps run' (up). A run that I used to call 6km. Bad first half, reasonable second half - 34:06 (5:53/km). Still feeling pretty tired. Legs OK though. 17 Dec nil Slept for 10 hours - the best training I've had for weeks. Watched some runners at ACT Interclub in the afternoon and raked the long jump pit. 18 Dec 18.6 Race: 6.30am! Tour de Mountain in 1:59:37 (6:26/km). Slow start. OK first 2 hills. Last 7km was like a BAD movie (Gosford Park) played in slow motion. Week 50 36km - Except for the PH Relays, a week best forgotten. 20 Dec 1.6 Ran the short warm-up around the ovals at Calwell with Al and Ben. Didn't do any other running. Just helped out and chatted to Mike. 21 Dec 12.6 With Chris from PH to Comm Park, War Memorial then Kings Ave Bridge in 71:20 (5:40/km). Steady run, breathing and legs felt OK. No injuries. HOT! 22 Dec 2 Race: 1 mile walk, 2nd in 8:40 (5:23/km). Javelin in 18.13m. High Jump in 1.35m! Equal with Jenny. Better technique. Used Frees (OK this time). 23 Dec nil A bit of a get-together after work. Once home, fell asleep on the couch. Must have been tired! 24 Dec nil Drove to Wagga. Christmas Eve. Didn't run. 25 Dec 10 To the Boat Club then around the Lake Albert track and back to Kooringal Rd in 51.06 (5.06/km). First 3k was slow, than ran quite well and freely. Week 51 26k - Darren Clarke would run more kilometres per week! 26 Dec 11.5 From Mum's to Red Hill Rd, ridge of Willans Hill, Railway Pde then back via Rocky Hill in 67.01 (5.50/km). Hilly and hot! Feeling yesterday's run. 27 Dec 4.1 Calwell. Short warm-up with Stu Mac and Siobhan. Hot! After training ran 2.5k warm-down with Stu in 13:33 (5:25/km). Dinner later with Stu and Jim. 28 Dec 14 Still hot at 7.15pm! Via Cooma Railway to Melrose Valley Farm, back in 79:16 (5:39/km). Tried to generate reasonable tempo but felt like I was plodding. 29 Dec 3 Track, Calwell. Short warm-up with Andrea. 5x200m in 46.8, 44.1, 44.3, 43.2, 43.1. 200m walk recov in 2:30. Felt uncoordinated and slow. Warm, windy. 30 Dec 5 7.37pm, still hot. Slow start then stretched out on the trail near 'Melrose River' for 5km in 25:41 (5:07/km). Not easy, felt OK. Walked briskly 4km home. 31 Dec 21.5 Molonglo Reach with Steve's group + special guest Stu Mac! To summit Mt Majura via Trent's hill, back via zig-zag + War Memorial. 2:14:55 (6:17/km). HOT! 1 Jan 7.2 Didn't want 'nil'. A very rare experience of running in Canberra with 31C heat at 9pm! 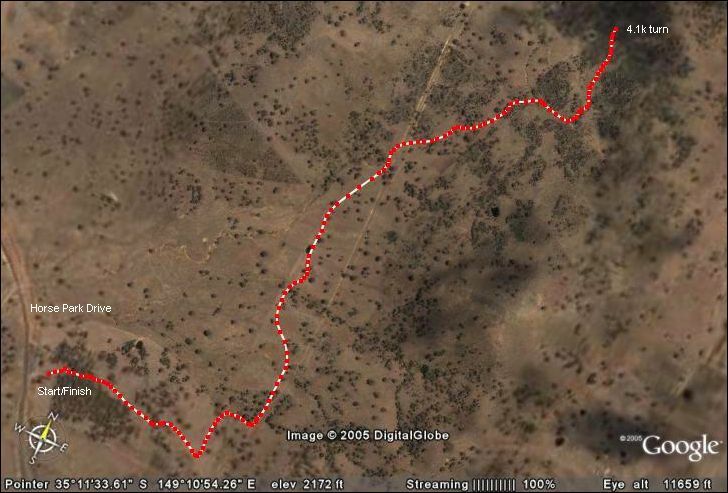 Theodore fire trail in 40:16 (5:36/km). Hilly. Form OK on flat parts. Week 52 66k - Enjoyed the runs with Stu Mac. 196km last 4 weeks. Goals: 1500m - didn't race one so a total failure there. 3000m - best of 12:21.06 (over by 1:22). 5000m - best of 21:03 (over by 1:55). 10,000m - best of 44:53.45 (over by 3:55). High Jump - best of 1.35m (under by 15cm). Basically I selected goals that were too hard and didn't compete enough on the track during the year. 10k road - best of 44:03 (over by 4:05). Half Marathon - best of 1:41:57 (over by 10:57). Six Foot Track - 6:18:10 (over by 18:11). Run 4000km - ran 3,048km (under by 952km). Gold Coast Half Marathon 1:41:57, Blackmores Sydney Half 1:50:52, Canberra Marathon 681st in 4:37:39. City to Surf 3,210th in 66:35, Canberra Times 10k 44:03, Six Foot Track 417th in 6:18:09, 3000m track in 12:21.06, 3000m track walk in 16:33. Numbers: Ran 3,048 kilometres, an average of 58.6km per week. Biggest month was February at 356km. Biggest week was the 6th at 107km. There were 106 days when I didn't run! That's over 3 months of missed training! Raced 25 times, 10 on the track and 15 'others' This page came in at 120kb which is a bit fat. In 2005 this page was viewed at least 2,212 times. Other words: Although I had a disappointing racing year, in other ways it was a brilliant year! It's been very rewarding trying to help Chickybabe to 'run out of sight on a dark night'. The 'Team Moore' sessions on Monday nights are always 'fun' and social occassions. Helping Mike with his coaching of the Calwell group has been very satisfying. I've also enjoyed helping out one or two other runners with coaching advice. I've tried to make a useful contribution to the discussions on CoolRunning Australia. My 2006 diary is here. Bring it on!